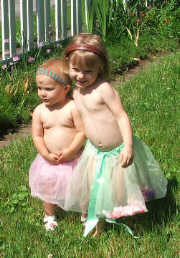 The girls dressed themselves up and went dancing in the yard. They were sweet, happy, and totally pleased with their costumes. When I showed the pictures to their dad, he described them as the title above indicates. What a couple of cuties! I feel like they're ushering out spring. I did see a forecast for a high of 90 degrees next week.